Jane Gold 18ct, 24ct and Rose Gold Plating or gilding as it is called are easy to do and as we have all seen gold, we know how attractive that it looks. As gold is an expensive metal it adds value to any item that is gold plated. Jane Kits have developed three soft gold options, 18 carat, 24 carat, and Rose Gold. All three are plated in the exact same method and produce a soft gold plating option predominately used for decorative pieces. Whilst it will provide a very desirable finish, it is not designed to be coated over objects that will be exposed to high wear situations. Jane Kits also provide a Hard Gold option, referred to as “JPK HARD GOLD” that is designed for high wear situations and is generally what is plated onto professional jewelry items such as rings, bracelets, chains, watches etc. The gold plate is a very thin film electroplated onto the surface of the job. The transfer of the gold metal on to the part to be plated (the cathode) is achieved by electrolysis. The better and shinier the surface the more successful it will gold plate. If the surface is not suitable to plate, then it is recommended to nickel plate it first. 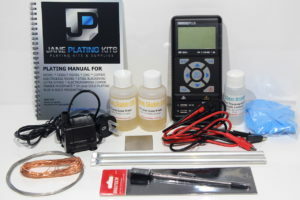 Jane Kits supply a Nickel Plating Kit or chemical that will be perfect as a coating under the gold. Non-ferrous items like medallions, chrome, copper or brass jewelry with a shiny surface will gild without nickel plating. A 100 ml bottle of Jane Gold concentrate contains 1 gram of Gold and a 100 ml bottle of Jane Gold, once mixed with water, makes a working Gold Plating bath solution of 1 litre. For items that have a good surface already you will not have to nickel. You will only need to nickel bare steel, copper or brass with a dull surface or any other dull surfaces. Gold will take to most metals. You will be able to plate stainless steel, silver, polished copper, badges or jewelry. Remember, poor surface will result in a poor finished job. Jane Gold needs to be at an optimum temperature for successful plating. The ideal temperature is 50 degrees Celsius. This means you will need to heat your Gold Plating chemical. The best way to achieve this is by placing your chemical in a plastic container standing in hot water in a crock pot or any other heating appliance. The temperature needs to remain in this range. A thermometer is included in the Kit to manage this. The Jane Gold chemical is mixed at a ratio of 1 part Jane Gold chemical to 9 parts water. Therefore if you have a 1 litre kit, add the 100 ml. container of Jane Gold chemical to 900 ml of water. The plating bath requires DC current to be run through the bath to effect a transfer of metal to be plated from the chemical. Gold plating needs very little power. The power supply will require the ability to be able to accurately adjust the amps or current to suit the amount of output required for the surface area of the object/s in the plating bath at the time of plating. The compact power supply included in this Kit is ideally suited for its quality, accuracy, controllability and size. A small specific grade of stainless bar is supplied to act as an anode or conducter and the 24 carat gold is part of the plating chemical. Also included in the kit is a compact agitator. This is used to keep the gold plating solution well mixed and circulating around the items in the bath that are plating. 1 x Power Supply – 3.75 amp compact power supply and connecting leads. 1 x 100 ml bottle of Jane Gold chemical (Jane Gold 18ct, Jane Gold 24ct or Rose Gold). 1 x Stainless steel anode / conducter. 2 x Aluminum pipes used as hanging pipes for anodes & job pieces to be plated. 1 x bottle Clear Shield lacquer. 2 x 100 ml bottle of Jane Gold chemical (Jane Gold 18ct, Jane Gold 24ct or Rose Gold). The chemical bath contents you receive will be in a bottle/s. The bottle has various chemicals mixed together and the entire contents should be mixed with water. The Jane Gold chemical is mixed at a ratio of 1 part Jane Gold chemical to 9 parts water. Therefore if you have a 1 litre kit, add the 100 ml container of Jane Gold chemical to 900 ml of water. For many types of electroplating, the anode is made of the same metal being deposited on the target object. For Jane Kits Gold Plating, the anode used is a specific grade of stainless steel, this is simply a conducter. The anode should be kept clean by washing and scrubbing clean periodically. Gold will take to most metals. You will be able to plate stainless steel, silver, polished copper, badges or jewelry. The better and shinier the surface the more successful it will gold plate. If the surface is not acceptable to plate then it is recommended to nickel plate it first. Jane Kits supply a Nickel Plating kit or chemical that will be perfect as a coating under the gold. Non-ferrous items like medallions, chrome, copper or brass jewelry with a shiny surface will gild without nickel plating. For items that have a good surface already you will not have to nickel. You will only need to nickel bare steel, copper or brass with a dull surface or any other dull surfaces. Remember, a poor surface will result in a poor finished job. NOTE: The Gold Plating chemical that is used to gold plate is HAZARDOUS if it is not used with care. Do not inhale the fumes that come off the chemical, especially while it is hot during plating. Stand back from it in a well-ventilated area, or do your plating in a well-ventilated room. If you can do that it is quite safe, there is no smell and no visible fumes.